Barcelona-El Prat international airport has the second highest volume of air traffic of all Spanish airports. It has two large passenger terminals, T1 and T2 , from where around a hundred airlines offer direct flights all over Europe. Intercontinental flights usually stop over Madrid or other European capitals but there are also direct connections with various cities round the world. There are also three smaller airports near Barcelona: Girona-Costa Brava, Reus and Lleida-Alguaire. Barcelona-El Prat, which is actually in the neighbouring town of El Prat de Llobregat, is 12 kilometres from Barcelona city centre. It has two large passenger terminals, T1 and T2 and three runways in service. The two terminals are linked by a free shuttle bus service. Girona-Costa Brava, 95 kilometres from Barcelona, is Catalonia's second airport. Various low-cost airlines operate from there, linking the airport with the main European capitals. 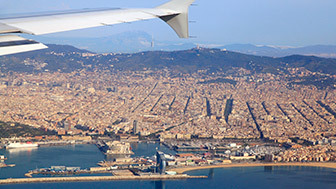 There is a bus service to Barcelona and some airlines offer services that coordinate with flights. There are also car hire companies. Lleida-Alguaire Airport has links with the main UK cities, Tel-Aviv and the Balearic Islands. There is a fleet of taxis to take you from the airport to Lleida and a high-speed train service linking Lleida with Barcelona, the AVE, which also has a Madrid connection. There are car hire companies at the airport too. This links the airport (T1 and T2) with Plaça de Catalunya and there are several stops on the way. There is a daily service from 5.00 am to 12.30 am leaving from Barcelona and from 5.35 am to 1.05 am from the airport, with buses every 10 minutes. The journey takes 35 minutes and a ticket costs €5.90. T2 has a link with Barcelona Sants Station, with a train every 30 minutes. Trains from Sants run from 5.13 am to 11.11 pm, and from the Airport, from 5.42 am to 11.38 pm. The journey takes 20 minutes and a ticket costs €4.20. TMB's Line 46 links Plaça d’Espanya with T1 and T2, with a bus every 25 minutes. The service operates from 4.50 am to 11.50 pm both ways. The journey takes 45 minutes and a ticket costs €2.20. Line N17 of the night bus service links Plaça de Catalunya and Plaça d’Espanya with T1, while line N16 follows the same route to T2. The service runs from 11 pm to 5 am, with buses every 20 minutes. The journey takes 40 minutes and a ticket costs €2.20. There are car hire companies at T1 and T2, plus various short-stay and long-stay car parks. There are always taxis available at the airport. Even though you may occasionally need to queue at the taxi rank, these queues are usually quite short. If there is not too much traffic, the journey to the city centre will take about half an hour. There is a supplementary charge on all journeys to and from the airport. 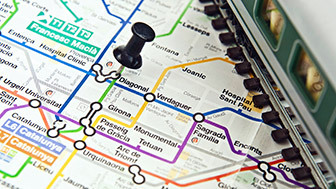 The L9 Sud passes through the Barcelona municipalities of Hospitalet de Llobregat and Prat de Llobregat. The tram connects Zona Universitària to Prat airport’s terminal T1. The metro service starts at 5 am every day and operates continuously throughout Saturday nights and the year’s festival eves. There are a number of car hire companies at the airport. Take the E-15/AP-7 motorway or N-II national road to get to Barcelona. Ryanair and the bus company Hispano Igualadina run buses from the airport to Barcelona. Bus times are synchronised with flights. There are several car hire companies at the airport. The Alsa bus company runs a service between Lleida city and Barcelona. The journey takes nearly two and a half hours and there is a bus every hour. A ticket costs about €40. The quickest way to travel to Barcelona from Lleida Airport is by the A-2 motorway. The journey takes nearly two hours.